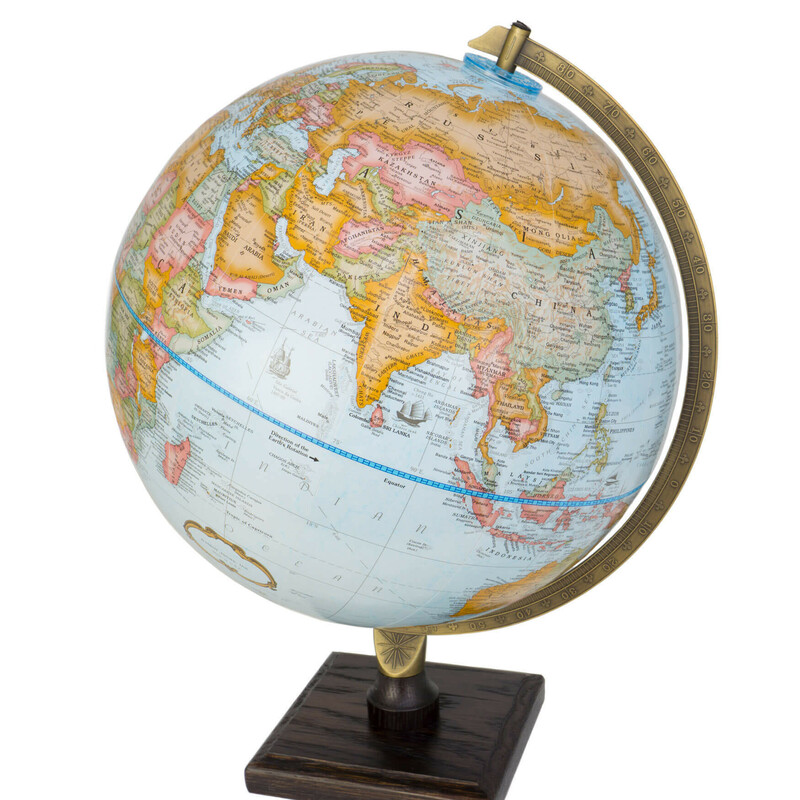 The Bradley Blue 12" (30cm) world globe is a welcome addition to the popular Bradley family of globes. The combination of pale (duck-egg colour) blue ocean colouring, a high quality meridian and a dark hardwood base make it ideal for any room setting. 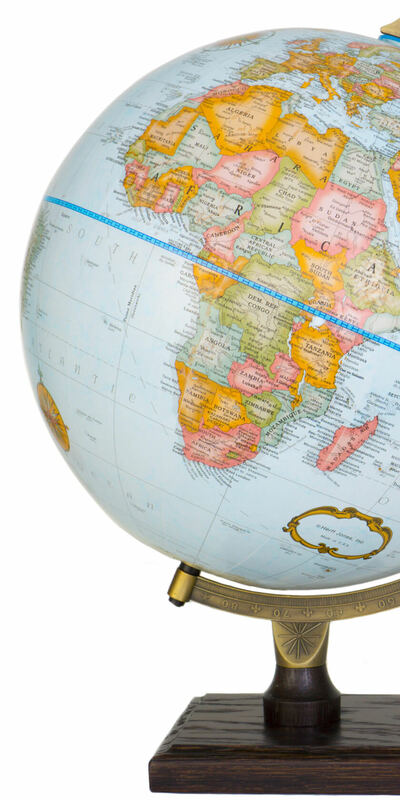 The globe ball is made using traditional techniques and features the popular raised relief, revealing the world's main mountain ranges in a tactile way. It has an up to date map with over 4,000 place names and pieces of information. The cartographer has included illustrations of historical vessels, together with names of explorers, the routes taken and the dates to add further interest to this beautiful globe. 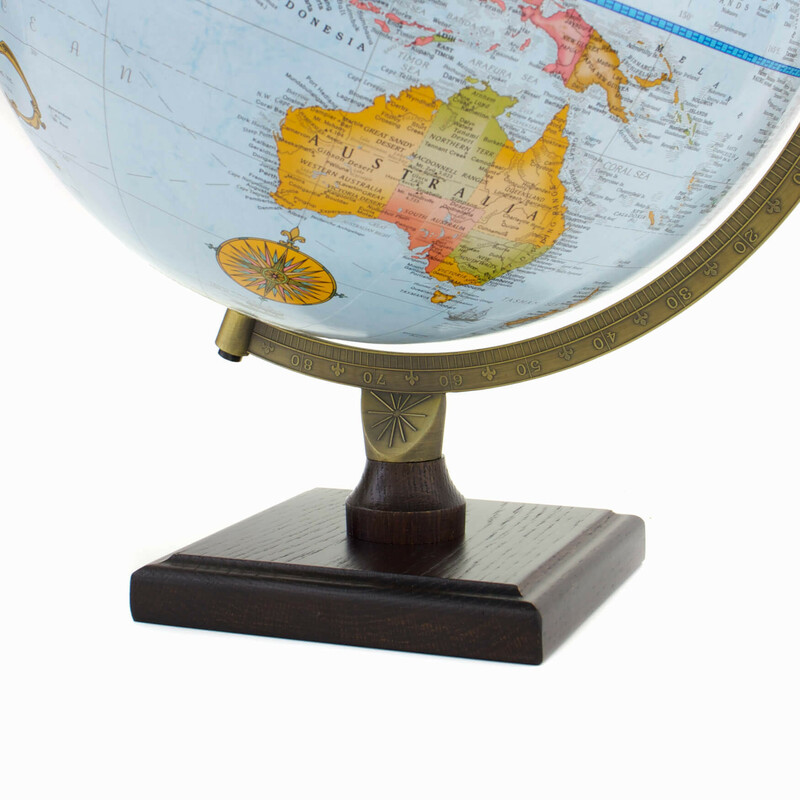 The Bradley Blue globe is mounted on an antique bronze style, die-cast metal meridian. Other globes in the Bradley range include The Bradley Antique, The Bradley Junior, The Bradley Illuminated Antique and The Bradley Illuminated Blue. 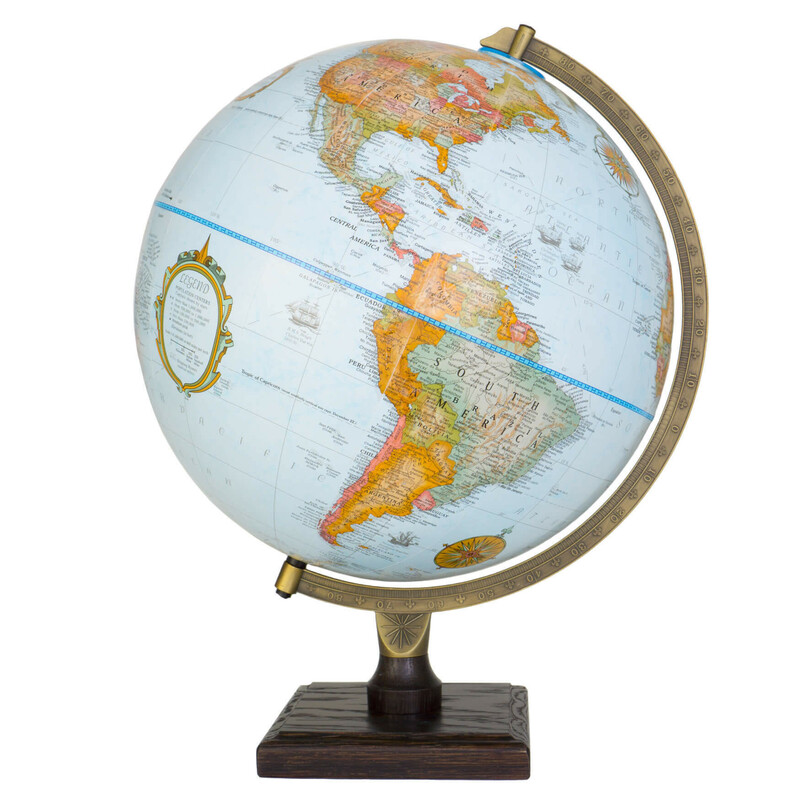 This globe is assembled in the UK, using recycled and recyclable materials sourced from the UK and USA and comes complete with a booklet on how to use, enjoy and care for your globe. 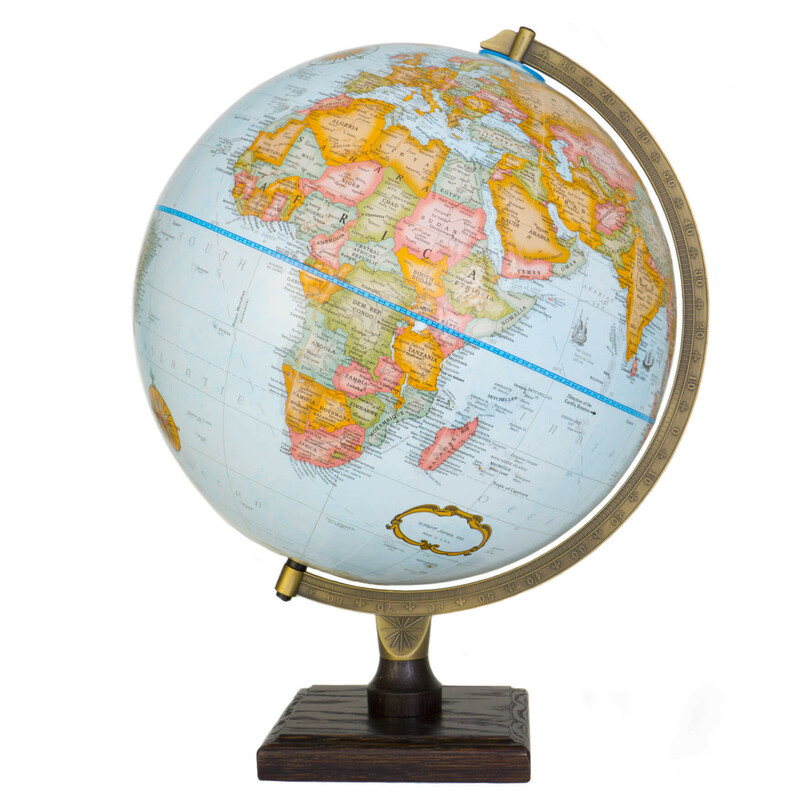 This globe is made in Corby, Northamptonshire, in the heart of the UK. Pale Duck Egg ocean colour giving a classic feel to the globe. Political mapping with clear country boundaries. Includes illustrations of ships on famous voyages and explorers along with the dates. Dark stained American White Oak base. Painted bronze style diecast metal meridian. I am very happy with the quality of this globe. The level of detail and definition is excellent. I especially like the raised mountain ranges and the illustrations of ships on famous voyages. Very sturdy and well built. Excellent product. Easy to read info.